You also, as living stones, are being built up a spiritual house, a holy priesthood, to offer up spiritual sacrifices acceptable to God through Jesus Christ….But you are a chosen generation, a royal priesthood, a holy nation, His own special people, that you may proclaim the praises of Him who called you out of darkness into His marvelous light; who once were not a people but are now the people of God, who had not obtained mercy but now have obtained mercy. (1Pe 2:5; 9-10 NKJ). The people of God as a kingdom of priests is as old as the Old Covenant itself. However, it is not a priesthood imagined by a good portion of Protestant thought. For what the priesthood of all believers does not mean is that in Christ every man becomes his own priest. It is this “liberation” from the ordained priesthood that began to be championed in the Reformation. The nature of priesthood is rightly described in 1 Peter as serving to “proclaim the praises of Him who called you out of darkness…” The heart of priesthood is its role of making offering to God – it is the very heart of human existence. We were created to be priests and kings of creation. Our “kingship” is given to us in our “dominion” over the earth (Gen. 1:28). The nature of our priesthood is described in Hebrews: “For every high priest is appointed to offer both gifts and sacrifices” (Heb 8:3). We “offer” the “sacrifice” of praise and thanksgiving: “Therefore by Him let us continually offer the sacrifice of praise to God, that is, the fruit of our lips, giving thanks to His name” (Heb 13:15). The role of a priest is to make offerings to God. A sacrifice and an offering are one and the same. The primary sacrifice we make is the offering of all things to God, through Christ. It is the recognition that everything we have, and everything we are comes from God and belongs to God. The offering is the very heart of our communion with God. It is this communion, this priesthood, that was disrupted in the fall when we chose to treat the created order as an end in itself. So when the woman saw that the tree was good for food, that it was pleasant to the eyes, and a tree desirable to make one wise, she took of its fruit and ate. She also gave to her husband with her, and he ate (Gen 3:6). The eating of the fruit – as an end in itself (“it was good for food”) – was a descent from priesthood into consumer. We ceased to make an offering of the world and chose instead to devour it. As such, it became death for us. Priesthood is the very essence of authentic human existence. Christ is the “Great High Priest” in the words of the book of Hebrews. The offering of Himself to God, on behalf of all and for all, is the fulfillment of every offering, the perfection of priesthood. In Him, all of the world is made into a sacrifice of praise and thanksgiving. Everything finds its true voice in Christ. The priesthood of Christ is the the fulfillment of all human priesthood. Both the universal priesthood towards all creation given to us in the beginning; the priesthood of all believers in the life of the Church; and the ordained priesthood within the Liturgical assembly and the ordered life of the community – all of these are manifestations of the one priesthood of Christ. The very nature of the priesthood is relational. No offering can be made unless there is something to be offered, someone to offer it and someone to whom it is offered. It is communion. This mystery, with regard to Christ, is expressed by St. John Chrysostom in this manner: “For You, O Christ our God, are the Offerer and the Offered, the Receiver and the Received” (γὰρ εi ὁ προσφέρων καὶ προσφερόμενος καὶ προσδεχόμενος καὶ διαδιδόμενος, Χριστὲ ὁ Θεὸς ἡμwν). This same relational character of the priesthood is abandoned by the individualism of each man as his own priest. Such a priesthood declares, “I have no need of you. I have no need of anyone but myself.” As such, it is the denial of the Church as the body of Christ. The paradigm of the self-subsisting priesthood has long since been taken to extremes. Not only does the individual need no other person, he needs no bread, no wine. There is no need for sacrament or Church. The non-sacramental-Church-as-fellowship-of-individual-affinities is the ultimate rejection of priesthood: it is the Church as consumer. There can be no doubt that the original rejections of the Catholic priesthood during the period of the Reformation was a reaction to rampant abuse. But the correction of abuse does not make adequate ground for a new ideology. In the rush to dismantle an oppressive system (you can only find forgiveness through the prayers of a priest, etc.) the true nature of the priesthood was obscured. The order of the Church was abolished and replaced with something new. The order of the Church is hierarchical, in the original sense of the word: “holy ordered.” The fulfillment of the Old Covenant by the New does not make priesthood obsolete, nor remove the need for hierarchy. The order of heaven and earth are themselves reflections of the truth of creation and the truth of God Himself. There is an order within the Godhead. The Father is not the Son, the Son is not the Father, etc. There is an appropriate subordination within the Godhead. The Father is the arche, the “source” of the Godhead in Orthodox language. The New Testament bears witness to the order of the early Church. There are Apostles, Prophets, Pastors, Teachers, etc. There are Bishops and Elders (Presbyters) Deacons and Deaconesses. The pages of the New Testament are replete with exhortations regarding this proper order. The title “priest” is somewhat misleading in English. In Greek, a priest is clearly Presbyteros, Elder. Indeed, the English word “priest” is derived from the word “presbyter.” In Russian, the most common word for priest is Svyashchenik (“holy man”). A presbyter exercises “priesthood,” in his ministry, but he also does other things. A Bishop is referred to as our “high priest” in some parts of the Liturgy, for his liturgical function is priestly, but he is also an “overseer” (episkopos) in other matters. There is a priestly ministry of the whole people of God (the proper understanding of the phrase “priesthood of all believers”) that is exercised within the role of the people of God in the Liturgy. That priestly role is not one of passive spectating. 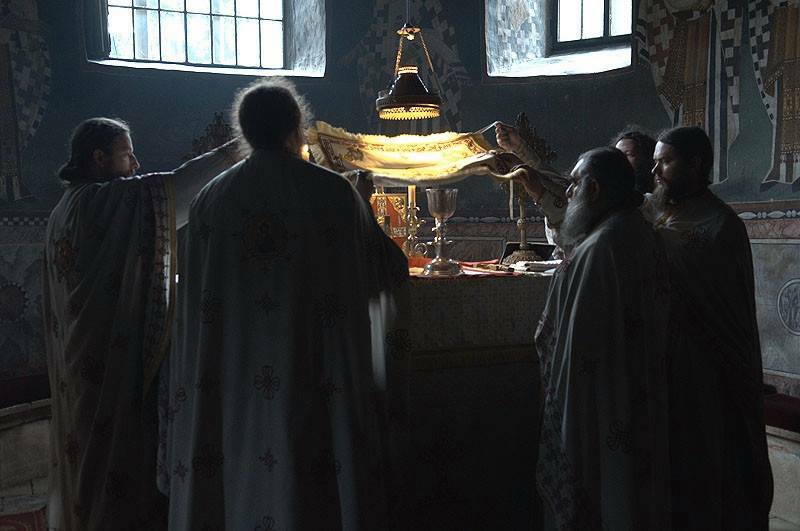 In Orthodox understanding, the priest never offers the Liturgy alone (there can be rare exceptions to this). The Eucharist is an act of the whole people of God, not a performance by one person on behalf of others. The Deacon bids the prayers of the people: “For the peace of the whole world, the unity of the Churches of God, let us pray to the Lord….” The people respond with the prayer itself, “Lord, have mercy.” The priest adds an exclamation that summarizes the prayer and offers a doxology, “For to Thee belong all honor, glory and worship, etc.” And no one voice is more essential than another. The Liturgy fulfills the words of Christ: “Where two or more are gathered, there am I in the midst of them.” Priesthood is not the act of an individual. An additional anxiety of the Protestant every-man-his-own-priest was the concern that an individual had to go through someone else in order to treat with God. “For there is one God and one Mediator between God and men, the Man Christ Jesus” (1Ti 2:5). When the Church has become corrupted, every relationship brings the threat of corruption. Thus the distancing from the Catholic priesthood during the Reformation was understandable. Probably the greatest unresolved issue of the Reformation itself was located precisely in the priesthood and in the Church structures surrounding it. Anglicans retained the three-fold ministry of bishop, priest and deacon, though it was nearly a century in becoming a settled part of English Protestant life (I think of Cromwell’s reign of terror). Calvin’s reforms established the presbyterian form of governance, creating a radical new structure for the Church. Others opted for congregationalist patterns of various sorts. Church order was the least agreed upon item of reform and eventually created the boundaries that became denominations within Protestantism. Our modern cultural individualism makes it hard for us to hear the communion-oriented character of the New Testament. We were not taught to pray, “My father,” but “Our father.” The nature of the Christian life, born and nurtured in love, is found in the communion of the Body of Christ. There is no Christianity that is outside the Church. The Church is not an organization to promote Christianity or an organization to promote Christian association – it is the mystical Body of Christ, the living union of God and humanity. The priesthood within the Church is nothing other than the priesthood of Christ. Within the ordered life of the Church it is manifested in ordained persons. The same priesthood is the primary service of all believers, the purpose of our creation. The action of every priest (whether ordained or not) is an act of communion – the offering and sacrifice of praise and thanksgiving to the Father, through the Son, by the Spirit, in the Church. Coming from a more reformed Anglican background,and having some jewish blood in me this article really stretches me in what a priesthood means. In early Anglican discussions, the debate was often about a bishop as the “bene esse” of the Church (for the “well-being”) or of the “esse” of the Church (the “very being”). The Reform wing of Anglicanism would have sided with the “bene esse.” Orthodoxy, not having been part of the Protestant/Catholic split over such things, tends to say both/and a lot. But the notion of offering/sacrifice and the nature of priesthood got lost a lot in those discussions. I’m glad this article stretches a bit. Comment: The priesthood proper is synonymous with (divine) person. Comment: One of the problems with the filioque is that it attempts to conflates the distinct persons of the one triune God. It also appears to subjugate the holy Spirit to the Son. Not that of course, we eat and drink doctrine. The Spirit is manifested by the Son but does not does not proceed from the Son. The Spirit derives his eternal being, His personal identity, not from the Son but from the Father alone. The Father is the unique origin, source and cause (my italics) of the Godhead. Further: The filioque can, says Met Kallistos, be interpreted in an Orthodox way & thus it becomes “a theologoumenon, a theological opinion although not a dogma” (p. 213). This is not the “fatal distortion” (p. 213) proposed by hawks. A cursory reading of Matthew 25 will put that one to rest. Source: The Orthodox Church, New Edition, 1997, by Timothy Ware; since 1982, titular Bishop of Diokleia and assistant Bishop in the Orthodox Archdiocese of Thyateira and Great Britain *under the Ecumenical Patriarchate). In my Baptist upbringing the basic teaching on priesthood was a simple negation of a straw man of Roman Catholic teaching. We were told, “You’re a priest, you have access to God through Christ on your own, you can pray on your own.” The access was the important point, and that’s something that neither the Roman Catholic nor the Orthodox Catholic Church has ever denied. What does priesthood look like? I remember one of the desert fathers who was a great ascetic, had hardly eaten anything for years. Each year his disciples would bring him a bit of the harvest of each kind of fruit. He would taste each fruit and say, “Glory to God.” I don’t remember who this story is about, but I don’t believe he was an ordained priest. He was still a priest. A very well-written article. Thanks. I don’t want to attach blame, however, as I understand it forays for dialog with the Eastern Christians were made by some of the Reformers, to no avail. The Orthodox were, to my understanding, unresponsive. The “something new” was of a necessity. Similar to the ante-Nicene Church, regional understandings, structures, liturgies (and theologies) developed in the Reformation which have made Protestantism the patch-work that it is. The unresponsiveness of Orthodoxy isn’t entirely the fault of the Orthodox. The period of the Reformation happened on the heels of the Fall of Constantinople. I believe the battered Church was in a difficult spot to deal with battered Protestants in Europe. Many Protestants adopted (and still have) a hierarchical system. The validity of the “style” of Church order remains, but the reformers were left to fend for themselves. In many ways, I see Protestantism as a sort of Jean Valjean. The illegality of stealing bread was never disputed by Valjean; however his need and the need of his family were never addressed by Church or state. His need drove him to the wrong thing (like Bonhoeffer). However, this didn’t diminish the fact that Valjean’s internal, consummate and passionate goodness was the core of his being. Like Valjean, most Protestants recognize the unusual nature of their origins (like Henry VII’s divorce). Their need wasn’t addressed by Church or state. They were driven to rebel to varying degrees. This doesn’t diminish their general internal, consummate, and passionate goodness as Christians. Your remarks on “presbyter” are really good. Thanks. On the topic of priesthood, I can’t forget this story from Anthony De Mello. The story may go too far, but the point it makes is worth considering, namely, that much of our religious activity misses the point. “There was a man who invented the art of making fire. He took his tools and went to a tribe in the north, where it was very cold, bitterly cold. He taught the people there to make fire. The people were very interested. He showed them the uses to which they could put fire – they could cook, could keep themselves warm, etc. They were so grateful that they had learned the art of making fire. But before they could express their gratitude to the man, he disappeared. He wasn’t concerned with getting their recognition or gratitude; he was concerned about their well being. He went to another tribe, where he again began to show them the value of his invention. People were interested there, too, a bit too interested for the peace of mind of their priests, who began to notice that this man was drawing crowds and they were losing their popularity. So they decided to do away with him. They poisoned him, crucified him, put it any way you like. But they were afraid now that the people might turn against them, so they were very wise, even wily. Do you know what they did? They had a portrait of the man made and mounted it on the main altar of the temple. The instruments for making fire were placed in front of the portrait, and the people were taught to revere the portrait and to pay reverence to the instruments of fire, which they dutifully did for centuries. The veneration and the worship went on, but there was no fire. No doubt, Protestants did what they could with a difficult situation. My thoughts were that their thoughts on priesthood were often reactionary and for many reasons failed to properly comprehend priesthood. It’s not a question of whose fault – just an observation of something that happened historically. As for the Reformation-Orthodox conversations – the Orthodox had indeed just endured the Fall of Constantinople and were beginning to endure to coming Turkokratia. They were not in much a position to talk with anyone. It was simply not a time in history that these things could have/would have born fruit. That’s the frequent tragedy of history. Are you equating priesthood with religion? If so, then I’ve failed to rightly explain the priesthood. Interestingly, with regard to the DeMello story, I was taught that the task of a priest was to stand at the altar, in the fire of the presence of God, and make the offering. I think about the Three Young Children every Sunday. I have never understood the “priesthood of all believers” to mean that I am a priest unto myself. Nor have I ever heard it put that way in any Protestant context I’ve ever been in. My understanding of the priesthood of all believers is that we are all priests unto one another, in that (or insofar as) we manifest the person of Jesus in all our interactions. So we confess our sins, one to another, and we pray for one another (James 5:16) and we serve one another. Matthew 28:18: “All authority has been given to Me in heaven and on earth. Go therefore and make disciples . . .” It doesn’t say that He gives us His authority. Instead, we go under His authority. Colossians 1:9-12, 15-20: “We have not ceased to pray for you and to ask that you may be filled with the knowledge of His will in all spiritual wisdom and understanding, so that you will walk in a manner worthy of the Lord, to please Him in all respects, bearing fruit in every good work and increasing in the knowledge of God; strengthened with all power, according to His glorious might, for the attaining of all steadfastness and patience; joyously giving thanks to the Father, who has qualified us to share in the inheritance of the saints. . . . He [Christ] is the image of the invisible God, the firstborn of all creation. For by Him all things were created, both in the heavens and on earth, visible and invisible, whether thrones or dominions or rulers or authorities — all things have been created through Him and for Him. He is before all things, and in Him all things hold together. He is also head of the body, the church; and He is the beginning, the firstborn from the dead, so that He Himself will come to have first place in everything. For it was the Father’s good pleasure for all the fullness to dwell in Him, and through Him to reconcile all things to Himself.” In short, all power, authority, and influence reside in Christ. So, no human hierarchy, no positions of power, authority, or influence. Only service. When Fr. Stephen refers to the “non-sacramental-Church-as-fellowship-of-individual-affinities,” I can see how that describes much of what passes for church in the Protestant tradition, but not in the way Fr. 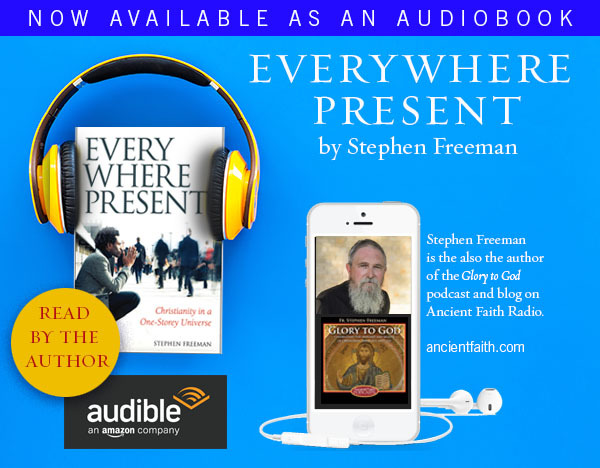 Stephen seems to mean it, as “the ultimate rejection of priesthood.” Rather, I see the “consumerist” church as an outgrowth of our forgetting all about “the priesthood of all believers” and what it is we’re supposed to be doing with and for one another. Finally, something on which we agree: “The Church is not an organization to promote Christianity or an organization to promote Christian association — it is the mystical Body of Christ, the living union of God and humanity.” Protestants have largely abandoned the mystical elements of the faith, along with anything (truly) supernatural. We give lip service to “the living union of God and humanity,” but that phrase is more or less meaningless in our intellectually driven church models. But neither is there anything inherently hierarchical in “the living union of God and humanity,” other than the natural hierarchy of Christ as head and us as His body. Boyd, here is a better story: God sent His son to become one with His creation through becoming human being without loosing his Godhood. His Son, revealed Himself to many but especially a chosen few which included being transformed and transfigured in their presence. 53 Then Jesus said to them, “Most assuredly, I say to you, unless you eat the flesh of the Son of Man and drink His blood, you have no life in you. 54 Whoever eats My flesh and drinks My blood has eternal life, and I will raise him up at the last day. 55 For My flesh is food indeed, and My blood is drink indeed. There are many things that, by the grace of God, I can offer up for His blessing and transformation: my self, my work, my wife and children but I cannot offer up the bread and the wine as a priest can. For that and the grace that offering brings, I owe them my life, yet it is not they that do it, but Christ Himself “for the life of the world”. Christ does not abolish hierarchy (holy order), but warns about its abuse. That something is abused is not a reason to abolish it, else we would have to abolish everything human beings touch. The priesthood of all believers has largely ceased within Protestant thought and life because the priesthood as an ordained concept, as an actual practicing reality, ceased to be and was replaced with a preacher, or something similar. There are certainly exceptions to this and even movements towards recovering some sense of priesthood. However, there is also the other trend, as mentioned, towards radical non-sacramental consumerism. To abolish the hierarchy is like abolishing the trinity which is itself a hierarchy, As well as a communion of persons. All of this perfectly balanced. The American Democratic ideal was birthed within certain strains of the Reformation. Obviously, it has much that commends it, though it has a kind of “leveling effect” that is positively disastrous. I occasionally run in to this in folks who are repulsed by the presence of an iconostasis. They feel that it separates the people from the altar – which it certainly does to a degree. There is this democratic strain which says within us, “I’m as good as the next chap! How dare they shut me out!” (that’s how C.S. Lewis would have had it said). But, we’re not as good as the next chap, and we’re certainly not as good as God. And it’s God’s altar. In Orthodoxy there is the rhythm of hiding and revealing. We hide things that are holy in order to reveal them (this happens a lot in the liturgies). Thus, what is unapproachable on the altar, hidden, etc., is also revealed. The doors are opened, and the priest, bearing the consecrated gifts come to the people saying, “In the fear of God, with faith draw near!” That which is unapproachable and too holy to behold, comes to us. This is the motion of God. The God who could not be approached, approaches us. But this cannot be seen in a Church which is “democratized,” where the altar is just a table in the midst of the people. The Holy God cannot be found there, but is hidden by our own “equality.” All of this is the piety that underlies so much of the sensibility of Orthodox liturgy and its lack is why people have difficulty “finding” God in the contemporary services of our democratic sensibilities. The same is certainly true of priests. People refuse to have a priest, because everybody is a priest and who does he think he is? At the end of the day, nobody is a priest and God cannot be found. If you’ll let a man be your priest, he stands a bit of a chance of showing you your priesthood. If you will not let another man be your priest, then your own priesthood will remain forever obscured. Agreed, Christ does not abolish hierarchy (holy order), and neither should we. But the “holy order” is simply Christ as head and everyone else as body, without recourse to an intermediate hierarchy of secondary “heads.” that, in practice, has led to an aggregation of certain, limited gifts in the hands of a few, and has served to narrow the focus of the life of the church to weekly ceremonies, rituals, and (in most Protestant congregations) lectures about the Bible. When the entire body submits to the one Head, and all the gifts are active, and all the parts (cells, organs, systems) are inter-active, the Body functions as it was designed — that is, as a manifestation of the person of Christ in the everyday life of the world. That something is largely unrealized is not a reason to abandon hope for it, but certainly we could use a resurgence of “equipping the saints for service” among the spiritually mature, and a refocusing of the body on the “holy order” of directly following, and depending on, the one true Head. Dave says: “It doesn’t say that He gives us His authority”. With all due respect, you aren’t describing Christianity as it actually existed. In fact, that Christians generally and the leaders of the Church more specifically are given His authority is exactly what the Scriptures teach: Christians are “joint heirs” with Christ, meant to be glorified together with Him, placed in the position of judging over angels. The Apostles and their successors are given the authority to “bind and loose,” the authority to “forgive sins”. Paul urges Christians to obey their leaders for a reason. I recall Met Kallistos touching upon this very point: seeing “only” Christ crucified is always going to be problematic – to paraphrase. Seems as though a follow-on to this …if I’m following you rightly… is to expand on the priesthood of all believers more as consecrating the sacrifice of ourselves, and the priest’s guidance in keeping us focused on this so that we can in truth become one mystical Body… and THEN… as and in communion, the sacrifice on the altar conforms to what we believe… and the priesthood is not one man, but all. Just thinking. 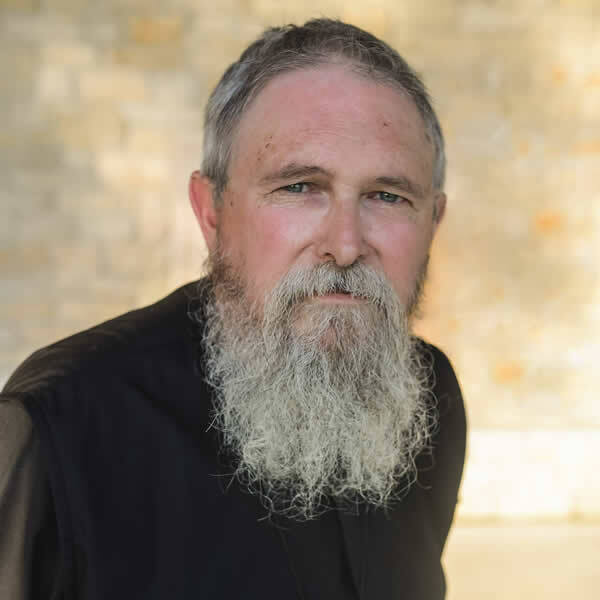 As our full-time jobs lie in the world, the priest stands between the two worlds, and helps our remembrance.. “keeping us focused” by dedicating his life as a shepherd. I think in protestant eyes, despite profession otherwise, the reality is that the man (now person) upfront has the place of honor, and so everyone wants to be there, to “matter” and be important before God and even to symbolize the importance they give to God. This is good in a way. I wonder though, that the recovery of the priesthood therefore depends on seeing that the place of honor is also necessarily beyond up being front, but everywhere and in every person… especially the priest… who becomes the least of these, the servant of all. I think this is one of the points of our icons… to make the presences of the saints who enable the life of our church apparent… so thereby we sense it’s more than just folks here and now. We don’t express this much, nor do we do all that much thereby… but tend to think we need to if we’re to share in Christ’s energies. Am I on the right track, or did I go off the rails? Father, this is precious reflection and your following comments are so helpful. Thank you. Right track, I think. Our cultural habit of seeing things – in which we have been trained to see the world as a stage, movie, etc. – makes us see the liturgy (and thus the priest) in the wrong way. We see him as the star of the show. But there is so much we do not see. I’ll use a cultural icon to illustrate. I’m a Star Trek fan. I recall the scene in one film where Spock gives his life to save the ship and his friends. He goes into a radiation filled chamber and does what is necessary. Think of the priest in the altar as entering a radiation-filled chamber (or Biblically, the fiery furnace). There he dies (with Christ) as he offers the bloodless sacrifice. I will say only briefly, may God forgive me, that people have no idea the assaults of the demons that a priest endures in the liturgy and in his ministry. God upholds him and sustains his soul so that he does not despair – I would not want to be anything but a priest – but if people could see the fulness of the reality – they would never see the priest as star, nor would they envy him the Cross God has placed upon him. They would fearfully thank God that he calls some to engage in such a work and pray for him, always. Thanks. Standing in the fire of the presence is a good one. As to your question, I don’t know, but probably so. I had a thought the other day more about monastics, but it could also apply to priests perhaps: The monastic life and the priestly vocation seem to me a bit like Jesus in the Garden, praying for us while we sleep. May the Lord uplift your soul Father. On the Protestant conversations with Orthodox in the East, it is important to know that many conversations took place. The Tubingen German scholars wrote many letters to the Orthodox patriarch in Constantinople. After years of discussion, eventually the Tubingen scholars simply gave up. The Orthodox would not accept their teaching on many things, among them the priesthood of all believers. These conversations are compiled in a book entitled, Augsburg and Constantinople; The Correspondence Between Tubingen Scholars and Patriarch Jeremias II. Check it out! It was a choice, and a clear one for most of the reformers. I don’t make much of those conversations. They took place, but at a time and in a context that not a lot could have been heard either way. Indeed the Reformers engaged the Orthodox, but the Orthodox were a very long way from really knowing how to speak to the West and the issues. The Scholasticism of the West (in Rome and among the Protestants) was still somewhat dominant in the formal settings of the East (Royal courts and Patriarchs). It was simply not a time for engagement. I think the Orthodox would have had a hard time having conversations with themselves had the need arisen. It was a fairly lousy time in Church history for everyone. They would fearfully thank God that he calls some to engage in such a work and pray for him, always. Father, your comment about demons brings to mind the increasing popularity of demons and hauntings as entertainment in movies and numerous popular TV shows. Your thoughts on the topic would be most interesting to me and others, I’m sure. To be more precise, I am asking about the nature of spiritual warfare. The feminization of the church in recent decades and the ignoring of Christian as soldier, marching as to war, have been a real loss, in my opinion. Source: Orthodox Psychotherapy by Metropolitan Hierotheos of Nafpaktos. If the bishop is priest to the priest, who is priest to the bishop? Who is confessor to priests and bishops? I don’t think very much, or often, about demons. I certainly don’t think about “them” – I think about their actions. Angelic beings are generally above my pay-grade. I confess to having very little understanding about them at all. So I let it slide. But I understand that a large number of the thoughts that assault us are not generated from within us. The demons are not omniscient. And their power was broken on the Cross. Thus, what is required of me is simply to resist (“resist the devil and he will flee”). But what we encounter is often quite cunning and we forget to resist. The more we confess and the more we forgive the less the demons have any hold on us. Still they can be quite cunning. They know how to mimic our inner voice quite well. Listen closely however and it is always a little bit “off”. The apple after all did taste good. Greetings Father from up the road in Hermitage. I appreciate what you said about the reformation reaction to RC abuses. I’ve always likened the reformation to a farm that got overgrown with weeds. Instead of clearing the weeds from choking the fruit, the whole field was burned, and then replanted with man made or GMO seed. But, my love to all through our Lord and Savior Jesus Christ, and thank you for your precious words. One of the problems, for Protestant understanding, that that English has one word — “priest”, where Greek has two, and that most English Bibles are etymologically incorrect in not translating “presviteros” as priest. Protestants say that the Bible teaches the “priesthood of all believers”, but nowhere does it teach the eldership of all believers. Oh, well said, Dn. Stephen! I very much appreciate this piece and heartily agree, though having Protestant roots, it took me a long time not to protest things like hierarchy and the iconostatis. But as you said, just because something is done poorly or even abused, that is not a sound basis for doing away with it, dumping the baby out with the bath water. Someone earlier tried to put forth the idea of Christ being the head and all the rest of us being equal members of His body. They used the image of the human body to convey this. But in fact each part of us (feet, hands, stomach, knees) is not attached directly to our heads. We would look and function much differently if that were the case. Also, human beings have natural limits on the size of the group they can relate to at various levels, but this is also reflected in the body. The head doesn’t do everything. The work is broken down into systems, which contain multiple organs, which are made of various parts, which are comprised of tissue, which breaks down into cells, etc – and there is hierarchy and administration at every one of these levels. We of the West are very fearful of someone even remotely having the ability to tell us what to do. We have worshiped at the altar of freedom for a long time and now we’re reaping the harvest from that. But I’ll say one more thing: we tend to be all or nothing. Either we won’t listen to anyone or we give our entire allegiance to something/someone and claim to the world that this entity can do no wrong. There will always be a need for discernment in this life.